Bunked office. Feel so guilty now. Planned to study. Slumbered instead. I remember making friends with a retired Canadian psychologist years ago. A wannabe Indologist, he had come across a Usenet post of mine, an experimental post to test its murky waters. It was great going initially, until he began gradually griping about my exotic choice of words. There were others causes of friction as well, including my apparently offbeat thoughts. Anyway, his constant cribs about my extensive malapropisms made me do a rethink on my style. Try as I might, I couldn't convince myself into believing the allegations. Well, countless people before and after him have leveled charges against me on similar grounds. There must be some truth after all! Sid's mail simply adds cause to the conviction! Loved what he wrote...although it was mostly beyond the scope of my limited vocabulary! Sid, the demarcation between me and 'normal' people was never so conspicuous! Thanks! Seriously, I'll try to do something about it. I love not belonging to the camp of 'normal' folks, but it's lonely camping in solitude. I set about republishing a hidden post featuring a video footage of Rohit's last day in Bangalore. I discovered, much to my horror, that the entire post had gone missing except for the heading, comments and the footage itself, which was hosted by Youtube. All those thoughts and elucidations were in vain! I feel so sorry for myself. Why did the text go missing? I never deleted it! If such anomalies are the norm for drafts, I'm afraid it calls for a serious rethink on my modus operandi for secret posts. I guess I'll have to look for other avenues. After all, I can't afford losing my most precious, intimate and potentially inflammable posts! Gotta checkout Yahoo! 360 as a backup repository. It was Ravi Rajesh's last day with us as a bachelor! He files to Kolkata tomorrow after which he travels to Ranchi by rail. Waiting eagerly for his return! I'm soooooo enervated after yesterday's party @ Club Cabana. I think I'll slumber at work today. Expect to post something in the evening after I reach home. Tried some bowling. Discovered (not to my surprise) how horrible I could be. The trajectories the bowls followed had no idea where to head and what to do. They rolled aimlessly, randomly and leisurely to miss as many targets as possible. Sure, if we reversed the aim of the game, I would be a champion by default! But who would listen? I couldn't bear the humiliation much longer and embraced the relative sanctity of being a mere spectator. Among the many things I didn't do were consuming alcohol, dancing (an improvisation of wild limb shaking to blaring noise mistaken for music) and jumping into the pool. Had a few meaningful discussions though. Overate, once again spoiling my resolve to shed weight. The mutton was too delicious to resist. Had 3 scoops of ice cream. The return journey was delayed and we were getting despondent. Rescue came after many excruciating moments. Mantu was getting increasingly worried at home. When I finally reached my destination, it was well past midnight. Felt completely sapped. Checked my mail account, changed and fell asleep. Old habits die hard. I've been publishing posts that I perhaps shouldn't, especially now. I'll exercise more restraint in the days to come, although the quantity of posts will not dwindle. They'll just be kept secret for the time being. So expect a thinning of visible posts in the days to come. I've got a confession to make: I think of 'doing it' all the time. I look at the computer screen at work, feel bored, close my eyes...and invariably think of doing it. I'm in the bus, staring vacantly at the maddening crowd outside, shut my eyes & think of doing it. I reach home exhausted and reeling; think of doing it. I wake up on weekend mornings, think of dedicating the entire day doing it...and end up complying for only a few minutes, exceedingly satisfying though it may be. I think of the blessed day when the object of my affection had come home with me for the first time. I was tempted to doing it that very night, but better sense prevailed and I didn't. We just lay together in bed before I fell asleep. But temptations are hard to resist and I finally did it for the first time! It was magical and very special, something that has kept me loyal for all these months. I can still recall the anticipation, the excitement, the apprehension, the uncertainty, the ogling and the decisive plunge. It was ecstatic! We lied together and I kept reminiscing what had just transpired between us. I drifted asleep after flirting with the idea of what lied ahead. I did it regularly after that, although not with the prolific frequency I had originally intended. It was always the same magic, the same surge of emotions, the same overwhelming, the same chemistry and the same feeling of wonderment that egged me on to newer and hitherto unexplored levels. Doing it each time left me a little more experienced and complete. Ya, I'm in the mood to do it again tonight. Gotta continue with page 64 of A Suitable Boy. Reading this book has been an experience in itself. Each time I do it, I'm wiser by a few pages. Vikram Seth's insight into the nuances of the human psyche is amazing. I must thank my lucky stars for granting me roommates who are excellent chef material! In Pune, it was Kaushik. And now in Bangalore, it's Santosh who's feeding me with daily culinary delights! It was lazy-hazy-crazy yesterday and Santosh expressed the desire to have chicken for dinner, a prospect I greedily latched onto. I sponsored, Santosh cooked and we ate to our heart's content. And there was enough to last us for lunch today. I guess my sponsorship has been well exploited! Even the PC couldn't accommodate all the surplus chicken at once. The stock could even drag on till dinner. Let's see. I'm only worried about by expanding waistline! Addendum: The neighbours have been trickling in ever since word got out. Wish I could shoo them away! Pandora, a crafty nifty site. This is cutting-edge technology @ its best! At 128 kbps, it may be too much for Indian broadband, but the audio quality is absolutely fabulous. The flash-rich site is a treat for the eyes and though the feature-heavy content takes time for the novice to understand, it's worth the trouble. It's Prasant's last day in Bangalore. He leaves for Hyderabad tomorrow & I'll miss him. Prasant, let me tell you why I didn't got to your birthday party: I hate crowds, and there were too many invitees. I hope you can forgive me for being so contemptuous. I don't regret not going, but I felt awfully guilty for not giving in even when you had insisted so hard on me joining. Reached home late last night. Even my thoughts are incoherent. Anand helped install Mandrake Linux on Santosh's PC. Even managed to surf the web through it, although it looked absolutely atrocious on screen! Santosh is now a contributor to the Hindi edition of Wikipedia. Busy punching entries for Jhanjharpur! And we finally had mushrooms for dinner. Absolutely delicious! Had some laughs. Subhash recently tied the nuptial knot. Rajeev settled into marital bliss a few months ago. I was in my usual foul mood and sang a hate anthem. But talking to Ujwal easily made me feel a lot better. Wish we could meet. I'll be having breakfast at home from now on. At least, that's the plan. Had grapes this morn. Keeping things as natural as possible. Gurdas had sent us a mail a few weeks back informing that he would visit Bangalore soon. I was so caught up with the wreck that is my life that doing a follow up completely slipped my mind. So Gurdas (fondly called Gorudas-a slave of cows!) called me up tonight and it was only then that I recalled receiving the email. Caught up with a lot of things. Rahul is in TISCO, Jamshedpur. Amarendra was last spotted somewhere in Jamshedpur. Shukanto-the biggest mystery of our batch-has apparently accomplished something commendable, although Gurdas couldn't really recall what it was. I just wish these people would take sufficient initiatives to be in touch with us. Living in the social fringe hardly helps. I should know! I informed Gurdas about Bads being in the US, slated to come to India soon for a month-long stint after which he'll be back there. Gurdas enquired if he's coming to India just for laundry! We had a laugh. Gurdas leaves for Mumbai tonight and I so wish we could schedule a meeting. Well, maybe next time. Nice to catch up with an old buddy! Addendum: It seems the surdar is incapable of thinking of any place in Bangalore South of Koramangala! So when I said that JP Nagar was further South than what his limited imagination would let him think (Koramangala, of course! ), he joked that I was probably in Kanyakumari! Samir Raut phoned. He'll probably come down to Bangalore in the next few days to try his luck. Santosh decided to cook some mushrooms for dinner. Hard luck, the shops didn't have them in stock. I've been skipping lunch for the past couple of days. This can't continue for long though. Gotta cut down on breakfast as well. Here's my question: How often does a person fall in love in a lifetime? (f) I have been truely and madly in love about ten or twelve times so far. I am 53. (f) Most people never do . They just think they do. I would say its most likely that around 10 in a million actually fall head over heels in love with someone and receive those feelings back towards them. Pretty **** i know but truth!! (f) As often as it takes him to find the right person. (f) head over heels in love...twice! i'm 26. so i guess that would average out to once every 10 years. (m) According to the bible, just once. 1 Chronicles ch.13 tells us about love. Try looking that up and make sure that all of those attributes are there before you go jumping into something. It may save you a lot of pain. (m) Certainly at least 3 or 4, and probably more like 8 or 10.It would be an unlucky person not to have felt it at least a few times. i've fell in love one time... most people just think they are in love but they are just fooling theirselfs. i think most of the falling in "love" we get are in highschool when our hormones are going wild. several times, it all depends on what type of person you are. (m) As long as his/her heart beats, mind you, love could be for life itself among countless other things. (m) i would say 2 or 3 after that there to gaurded to make that mistake again! (f) only once i believe....no matter how many gfends/bfrends u have there is always one u will never forget or stop having feelings for whether u r together or not. well i am a believer that love comes only once in a lifetime, it may sound a bit extreme to all of you, but it is true ... people who say that they have fallen in love more than once may have been attracted to someone more than once, they may have been obssessed with someone more than once, but love? this feeling of superiority, of completness, the feeling of flying away ... this just comes once in a million years!! (m) I think it totally depends on the personality of an individual. For some it may be just another day in one's life. Like just falling in love for a while n then then just falling out the same relationship. However, for someone it might mean a lot. Like ..people say...they wait for that love to happen in their life.So, I think it's quite a subjective issue. However, in my opinion, I think..that true love can happen only once in lifetime...!! My opinion will be posted in a fortnight's time. By the way, what do my readers opine? Didi, mom and co. are leaving for Gangtok today. Dad is gone & I have no one to talk to. My blog is my only solace. Santosh, Mani & Mantu went to a job fair today. Unfortunately, most of the available posts were for the experienced guys, not freshers. Funny: My vocabulary is rather limited...but Blogger's is much worse! I can excuse it for being ignorant of Indian names, but some of its suggestions are just too funny. Here's the suggested alternative for Santosh: Sanitize. I won't even mention the other suggestions! How valuable is my site? 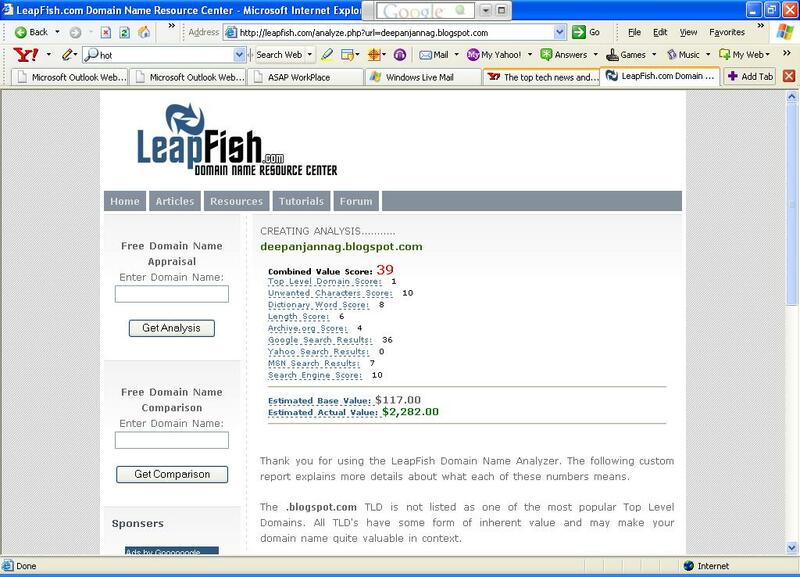 This is LeapFish's estimation. The Yahoo! Search Result score seems to be wrong. It should be 10, not 0. Not really, but my socks indeed stink! And since my socks go wherever my legs go, and since my legs go wherever I go, wherever I go...stinks. Okay, I'll take my word back. Bangalore doesn't stink! Santosh has won himself a female fan apparently living somewhere in the US. After the copyright scare, Santosh deleted all his uploads to Youtube, and this broke the mysterious lady's heart! Santosh, clearly, couldn't afford to see this...and instead sent her an entire video via Uploadr since the file was far too huge to be sent via email attachments. The process took an hour-and-a-half, but our boy has enough patience to last him a lifetime! Expect repeats...though I'll not mention them here. Should Da Vinci Code (the movie) be banned? Freedom of speech & expression is a fundamental right in India. Then why should this right be curbed just because a movie puts forth views that contradict conventionally held wisdom? Society should be mature enough to assimilate views that are seemingly at loggerheads. That's the only way to social & personal amelioration. Sure there'll be people who'll be supremely upset by the very foundations of their faith being shaken. But if their faith is indeed right, shouldn't it be allowed to measure up to the challenge? The beauty of civilization lies not in its homogeneity of thought...but in the lack of it. It's the multitude of thought processes that allow us to pick the best. It's so sad to see the government doing so much harm to its own citizens. I guess even British Raj was better than this. If nothing else, it at least served to unify us. Look at what's happening today. Caste divides are once again gaining prominence in our society. As if we didn't have enough forces to divide us anyway, the political fraternity seems hell bent upon digging our graves. The caste-system, an anomaly of ancient India is simply being reintroduces and reinforced by corrupt government polity. It's time for us all to see through the sinister motives behind it all and stand united in defeating the curse of caste discriminations. It's heartening to see so many citizens (mostly students) joining forces to protest against the administration's ulterior schemes. All is not lost...at least not yet. First Yahoo! & Microsoft both offered me upgraded versions of their popular email destinations on the same day. Now, they've done it again! Yahoo! has just unveiled its AJAX powered homepage while Microsoft has added Firefox support for the Windows Live Mail Experience, a niftier cousin to the vanilla Hotmail Classic View. And if you haven't guessed it yet, these upgrades once again happened on the same day...today! Especially heartening is Microsoft's gradual support of the open source phenomenon. Their open source labs are hard at work trying to make interoperability a reality. If it treads the right course, its victory will be decisive. I was, am and will remain its greatest devotee! Met Sreelatha ma'am in the cafeteria after lunch. So nice to freshen old memories! BTW, it was my first day in the new cafeteria. The food tastes distinctively different. However, there isn't sufficient floor space or ventilation and the whole place looked too crowded for my liking. The canopy causes the place to resemble an oven in the afternoon. Enough to bake me in half-an-hour! Enjoyed the change though. And I took my weight today(in the morning). Won't even bother to mention how dangerously the scale tipped! Never ever had I imagined such a day would dawn! It's time for some desperate measures. Spoke to Yamini in the lift. So long a wait! 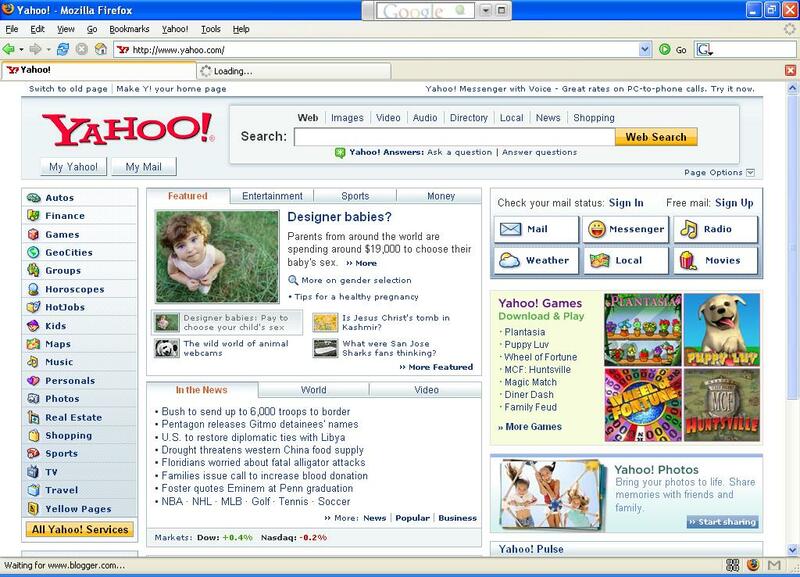 Guess what, my Firefox is being treated to the new-look Yahoo! homepage. IE still shows the old homepage. Addendum: OK, now IE too is showing up the new interface. There was a link to switch from the old to the new. Our tower's cafeteria became functional from today, though I'm yet to visit it. The initial reviews from my colleagues seem to be favorable. Santosh has removed his videos from Youtube! Guess I underestimated how intimidated he felt by copyright infringements! It seems I've gained an expertise in chopping onions! That's what I do en masse every Saturday night as a prelude to Santosh cooking my favorite delicacy: Anda Bhurji! Strangely enough, there are no tears involved. Removed Rohit's video since some people were bugging him about it! Hard to imagine how many people actually bother to go through my posts. The post will resurface in the archive soon. I don't like innocuous posts being censored. Santosh is now employed full-time in flirting with Youtube, Orkut and Wikipedia. Ever since I helped him discover the virtues of streaming video via Youtube, he has been busy entertaining himself with the choicest of streams, mostly Indian. Uploading some videos from his own computer was to follow soon, and it did so with fanatic regularity; even though the bandwidth-hogging exercise tried our patience. And if the connection is severed in the middle of the upload, it's back to square one! But my dear roommate is not to be deterred by such tribulations. Here's an idiosyncrasy that had vexed us no end. Mani's computer acts as the proxy server for Santosh's PC. Each time sometime toggles a switch in his room on/off, there's an electrical disturbance that disconnects the systems from the Net. Now you can well imagine how irritating it is for us to put up with the frequent disconnections. The remedy is simple. We simply have to physically disconnect and then connect the modem! What a crude thing to do in cyberage! Anyway, some guys scared the hell out of Santosh saying that blatant copyright infringements (by way of illegal uploads to Youtube) would land us all in trouble. Santosh was visibly upset and almost rebellious to the suggestion that the big guys would come hunting for him through his IP address. Ya, that could happen! What's endearing is the heartening comments he has been receiving from strangers for the videos he has uploaded. That's yet another way of experiencing the novel phenomenon of social networking. Which brings him to yet another site that's dedicated to glorifying people-networking: Okrut. Orkut seems to have a strange hold on newbies. It is now a regular feature on Santosh's Firefox tabs! Often Santosh's network manages to take him to a fellow who stays no further than the next-door! But what the heck, it's more fun to do mundane things via cyberspace, right?! Not all contacts live nearby, I must confess. And this is where Orkut really shines. Needless to say, Santosh is on the lookout for guys who share his own ethnic background here too! I guess the pull of soil is too strong to be nullified by personal engagements! Wikipedia still reigns supreme on Santosh's daily agenda. His spirited inputs for Jhanjharpur (both textual and multimedia) would soon make the village look more illustrious than Paris! Well, almost! So what does my roomie do when there's no Net connection? Romancing Picasa, of course! He spends his precious offline hours cropping, highlighting, rotating, color & contrast balancing, renaming...literally glorifying his image! How late into the night does he endulge into this covert hobby, I'll never know. But it's long after I've drifted asleep. I've lost track of the number of times I've been asked to change my Blogger photo since I uploaded it a few days back. Is it really that bad? I actually loved it. Loved it so much that I almost fell for it! If people are griping about the photo, it simply means they've forgotten how mediocre I look in real life! Ya, that's the number of messages someone sent me continually in an impromptu therapeutic session! I docked my Nokia to the PC since punching keys on the tiny keypad is not my kinda thing. But the other end didn't have such luxury. Thanks, buddy! I hardly merit the pains you took to answer my plaintive messages. Though I refute some of your views, I agree with most of what you said. I guess we choose friends who echo the voices in our subconscious mind. You echoed them well, although they were sometimes lacerating. A friend like you is an asset. Thanks once again for being there. Got wind of something that was inevitable. Still, it makes me sad. There'll be a companion secret post in a few months. This is big. Alltheweb, my one-time favorite search engine now comes with Livesearch, a technology demo from Yahoo! Love it! After being obsessed with Wikipedia entries for his native place, Santosh has now turned his attention to uploading Bhojpuri songs to Youtube. I love the mania with which he works. Just do a search to view his uploads. Posts that lack sufficient investment of thought make a poor read. Go through my recent posts, you'll get the idea. It's amazing how deeply my ambiance affects me. I've really hit rock bottom. I'm tired of griping about the highly erratic and anomalous IE. I was expecting things to return to normal after switching back to IE 6. Things were working fine until I got adventurous once again and decided to download the MSN Toolbar since it allowed tabbed browsing. I'm so used to tabbed browsing (via Firefox) and now that my task bar is so infested with a plethora of tasks that I just can't do without it. Downloaded it. It worked fine for a day. Then it went crazy. The moment you tried opening the third tab, the IE window closed along with all other IE windows I had! Tried the same thing multiple times and each time the same problem surfaced. This will be my last post complaining about IE. Frankly, I'm growing tired treading the same line. My cup of woes is flooding anyway. Called up Sameer Raut in Mumbai. Sounded routed and dejected after failing to clear the bank exam. I earnestly hope his struggling days come to an end as soon as possible. Guess what would have happened if I hadn't spurned a previous offer to do some Java coding. I would be in Sweden in a few days from now! Greed has done me in. I'm starting to believe in sinister celestial schemes. The weather mirrored my melancholy. It rained on our way back from office. We had a meeting and my blog was projected to the huge screen for all to see! How embarrassing! Now this is ridiculous. Hotmail won't open in IE 6, but works fine in Firefox! I've heard people crying hoarse about Firefox failing them so miserably, they had to revert to their beloved IE. Since I'm on an installation spree on my stark-naked desktop, I thought of downloading and installing IE 7 Beta 2. I did, only to repent within a matter of few minutes. The bleeding-edge embracing IE came up with a peculiar memory error within a few minutes of being launched each time, forcing it to shut down. I tried it many times and each time the same memory error was being thrown at me. I even tried rebooting. Nothing helped. Had to uninstall it after that. My previous flirtation with IE 7 had not been a happy one either. For the moment, I'll remain loyal to Mozilla Firefox. By the way, IE is indeed indispensable when surfing certain sites. And you don't even need to launch IE to visit those sites. Simply try IE Tab to use the IE rendering engine from within Firefox itself! Mission accomplished! By the way, there are sites that indeed work better with Firefox! I had a thousand pleasant thoughts sprinting across my head-nourishing fodder for my blog. Alas, all is lost...to my despendency on account of, well, you know what! I'll need time to recover. I've lost the will to write, I've lost the will to fight, I've lost the will to do anything creative. It's a given that I'm an emotional wreck and certaing things affect me deep. My thoughts are all clogged. Got my new desktop. In keeping with custom, installed Firefox first thing this morning. Look at the newly uploaded Flickr snaps. Created first secret post. Very minor but highly inflammable in content. Remind me 20 years later to throw it open! Adding another dimension to my blog! Bunked office. Felt sick, metaphorically speaking! Believe it or not, we have no holiday for the next 100 days excluding weekends! ...who has been visiting my blog and couldn't help emailing me tonight! I love receiving comments from all and sundry because it lets me know what people think. There's nothing wrong in remaining anonymous, you are just exercising your right to privacy. I value people who think and have an open mind. If you are one of them, you are indeed lucky! Few people have an independence of thought. Do you know why most people think alike and have the same views? It's because most people don't think at all! They simply latch on to borrowed thoughts of the precious few who can think! I would appreciate your continuing to visit my humble blog. At least it'll prove my abysmal writing has sufficient pull! 3 consecutive holidays! I planned to diligently read through 10 chapters of ABAP. I covered just 1! Blame the Net. Dhyani has finally got a project, although it's different from mine. He'll probably have to shift to another facility, and if that happens...well, I'll sorely miss him. But I'm happy for him since his new office will be closer home.